The biggest news last week was no doubt the Supreme Court ruling upholding President Obama’s Affordable Care Act (ACA), or you may know it by its catchier on name ‘Obamacare’. The Act does a lot of good for different groups of Americans, but the one I want to look at is the biggest: women. This ruling was good, and I mean good news for women, i.e. half of the entire population of the US. It was like a ‘Hallelujah!” moment for women across the country (although those that don’t support the act, likely do not think so, even though they too will benefit from it!). Why was the ruling so good for women? The act will end health insurer practices that actually contradict good health practices (one would think that better health for those insured would be the ultimate goal, but it’s not). Basically you and/ or the females in your life will now have better access to more affordable coverage with more reproductive health-related specific health care measures put in place. AND, something that I find particularly exciting, (brace yourself) preventive services will be covered. Covered, as in no extra out-of-pocket cost for life-saving screenings. This is a big deal for the health of not only women, but the entire country. These new changes are all great for American women; but, I think the most important issue these provisions address is the issue of gender equality. This act was designed from a sound social equality, human-rights based approach in which no one can be discriminated (i.e. not given coverage, not offered coverage, or charged more for coverage) based on their gender, much like women were before the act. This is a country where legislation that intends to make sure that women receive equal pay for equal work is blocked by a major political party. You can imagine how such hotly contested legislation as the ACA, which also seeks to give women equality, winding up in the highest court in the land where it is passed is a very important issue. The scariest part (although I think many would argue with me on this) about the ruling is the fact that these inequalities persisted for so long without any change. Women’s health has been a major national issue for 50 years, but the health care system has hardly functioned effectively for women’s health needs. Women were getting charged more by insurance companies because they were born with the biological predisposition to bear the ‘burden’ of keeping this world populated. That seems a bit….off, no? And, it’s not like women were doing great paying higher premiums or going without insurance. Just look at the most basic indicator for maternal health, the maternal mortality ratio, for the US which was 24 deaths per 100,000 live births in 2008. That is not a good statistic, not at all. Perhaps this is due to the fact that more than 19 million women don’t have health insurance. That is a ridiculous amount of uninsured, potential baby-making women for an advanced country like ours. 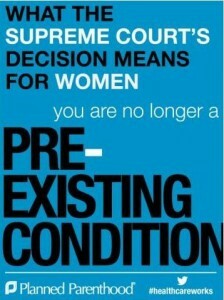 Unfortunately, the Supreme Court ruling wasn’t the final word on the ACA or how it affects women. There’s still a House of Representatives vote coming up and there is no sign of the backlash against the ruling abetting. 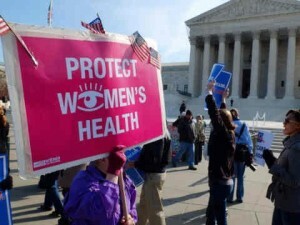 Perhaps this ruling may have been more of a symbolic victory for women’s health rights in the US, but whatever the ultimate outcome may be, there is no doubt in my mind that the day the Supreme Court ruling on the ACA came out was a historical day for women’s rights in this country.